Fishville's Notes: Looking at the photo above, Yale's flag was hung on the front gate of Harvard's Widener library. It was a fiction by an article predicting the atmosphere of the higher education in the United States in 2020 with the ultimate result of Harvard and Yale being forced to merge into a single university, a hilarious piece for a fun read in the weekend. This would be happened when Jodie Foster is the President of the United States of America, the famous Hollywood Star and the sixth Yalie who becomes the U.S. President. The newly formed university would be named Ha-Ya or Harley under the leadership of its president the grown-up Tiger mom's daughter Sophia who decides to matriculate Harvard recently. The article also predicted the termination of the proud history of Princeton University as an independent American university because Shanghai University just recently announces to purchase Princeton. In the meantime, Stanford faces the pressure and chooses to close down all of its undergraduate programs by only focusing on graduate educations for medicine, business and law. It would be interesting for somebody to figure out the Alma Mater (s) of this article's author (an update: she got her degree in English from Wellesley College). May 28, 2020, was a good day for the American economy and a momentous one for traditional colleges and universities. President Jodie Foster, the sixth Yale graduate to reach the White House, announced that the congressional agreement on Medicare and Social Security had finally begun to reduce the country’s debt, and the disastrous bout of inflation was subsiding, as the consumer price index inflation rate had fallen to 12.3 percent for the first four months of the year. For Harvard and Yale, the news was not so good. Although they continued to reject 93 percent of their applicants, actual enrollment was falling, and inflation had made their endowments almost worthless. A few days earlier, Shanghai University had announced it was purchasing Princeton, and rumors circulated that Stanford would close its undergraduate school, reconfiguring itself as a professional school in law, medicine, and business. 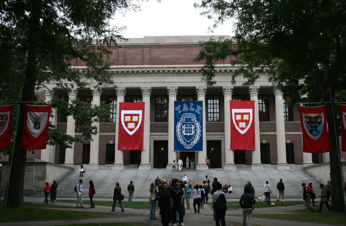 As a result of the changes engulfing traditional education, Harvard and Yale announced a merger. On the brighter side, the president of BGU, the online Bill Gates University, crowed that the school had produced six Rhodes scholars, and there were reports that Stephen Blackwood, the founder of Ralston College back in late 2011, would start his sixth “Great Books” college, this one in Florida. That same day, faculty members at the University of Phoenix issued a report analyzing the cataclysmic changes that had occurred in higher education over the past ten years. They traced the history back to a New York Times columnist, Ron Lieber, and two articles he wrote in 2010 and 2011. They dubbed him the “short seller” of higher education. May 28, 2010. “Your Money” columnist Ron Lieber interviews Cortney Munna, a graduate of New York University who owes $97,000 in student loans and works for a photographer earning $22 an hour. The story receives over 600 comments. April 9, 2011. Lieber suggests that instead of paying up to $50,000 a year for the first two years of college, parents should consider sending their children to community college and then transferring to a “name” school. September 22, 2011. The American Association of Community Colleges (AACC) announces that enrollment increased so much this fall that its members are overwhelmed, especially given tight budgets and cost inflation. January 12, 2012. The AACC recommends that its members cope with high enrollments by giving students credit for introductory courses provided by the “unaccredited sector.” For example, they can take courses from StraighterLine, a company that produces basic courses for $99 a month plus $39 per course. Or they can get credit for life experience from the Council for Adult and Experiential Learning. April 15, 2012. UNC-Chapel Hill and Rutgers report a 62 percent and 59 percent decline in freshman applicants, respectively, as high school graduates move to other forms of education, in record numbers. Inside Higher Ed says that private colleges around the country are experiencing a similar decline in applications. January 16, 2013. The University of Phoenix and Strayer University change their business model, lowering prices and offering a wider variety of transferable college credits. The Chronicle of Higher Education reports that other for-profit schools are reducing prices, too. September 16, 2013. Education Secretary William Evers announces that for the first time ever, Pell grants have gone begging. Inflation has made them trivial, and in some cases online prices have fallen too low to bother with the red tape of the FAFSA form. The National Association of Independent Colleges and Universities (NAICU) appeals to Congress for stimulus funds. January 16, 2014. The College Board reports that the number of high school students taking online Advanced Placement courses exceeds the number taking face-to-face classes. Jay Mathews, education writer for the Washington Post, recommends Khan Academy, a nonprofit venture that provides over 2,000 courses online at no cost. April 15, 2014. High school AP teachers organize to protest the overuse of online AP courses; but the University of Phoenix hires 6,000 to teach AP online. September 20, 2014. Entrepreneur Peter Thiel of PayPal and FaceBook fame purchases Khan Academy. The academy remains free of charge, but is supported by advertising. January 14, 2015. Urban Planet Mobile obtains accreditation from the Southern Association of Colleges and Schools (SACS) for foreign language courses using cell phones and announces plans to expand cell-phone tutoring. July 1, 2015. The Chronicle of Higher Education reports that public universities from the University of Michigan to Tennessee State are having trouble filling their freshman classes. Too many students are starting out elsewhere and transferring in later. September 16, 2015. Vanderbilt and George Washington University raise their tuition to $70,000 per year. Applications dip. Harvard initiates the first three-year bachelor’s degree in the Ivy League. February 2, 2016. Wake Forest, Georgetown, and Pepperdine announce that they will follow the advice of Oklahoma State University business professor Vance Fried: they will spend down their endowments. They offer 50 full-ride scholarships at each school and bring tuition down to the level of the University of Phoenix. Enrollments and SAT scores soar. December 15, 2016. Wake Forest, Georgetown, and Pepperdine each move up five positions on the U.S. News and World Report rankings. uggests that some young people without college degrees are using it to show their accomplishments as well. May 15, 2017. At the urging of Virginia Foxx, chair of the House Subcommittee on Higher Education, Congress allows regional accreditors to compete with one another. Inside Higher Ed predicts that this will cause more schools to enter the market, driving prices down further. January 15, 2018. Troy Camplin, who has a Ph.D but is not affiliated with any college, follows through on a plan he outlined in April 2011. He receives the first SACS accreditation as a “free-lance professor.” This enables him to be paid directly by his students and to rent out classrooms at the schools of their choice, as all their classes will be accredited. The AAUP applauds the move. May 10, 2018. Reason.com releases its “Adam Smith, Prof.” video featuring Camplin, explaining the advantages of contracting directly with professors. The video goes viral. August 12, 2018. The Hilton Hotel chain invites Camplin and the growing number of other “free-lance professors” to bring their far-flung students together two or three times a year to network and exchange ideas. Colleges with climbing walls and lavish sports facilities (such as High Point University and the University of Michigan) have also quietly offered their services, reports Inside Higher Ed, and airlines are offering discounts. Education is “disaggregating,” explains innovation guru Clayton Christensen. January 15, 2019. Harvard and Yale announce that tuition will rise to $85,000 per year. Applications remain extremely high, but enrollment falls, as both universities decline to dip into the large number of rejectees to replace the accepted students who decline to come. Getting into Harvard and Yale is honor enough; going there is just too expensive. March 25, 2019. Inside Higher Ed reports that many Harvard faculty are seeking individual accreditation a la Camplin. September 13, 2019. While some colleges are bleeding red ink, others, such as Greensboro, Grinnell, and Hope, copy St. Mary Magdalen College, which combines small classes, a core curriculum, and low tuition. They supplement that model with online courses from StraighterLine, Khan, and Peer to Peer University. May 28, 2020. Harvard and Yale announce their merger. According to the report, the first priority of the new president, Dr. Sophia Chua-Rubenfeld, “Tiger daughter” of Amy Chua, will be to discuss a low-tuition business model. The new university is popularly known “Ha-Ya” or “Harley,” and the famous Harvard-Yale football game will now be a low-key intramural event.